Oh boy do I have a beef stew recipe for you. If you're looking for some comfort food, you've come to the right place. In my house beef stew is a once monthly, meal the wife loves to cook from early October to late February. This dish is always convenient because we are always stocked with the main vegetable ingredients. I mean who doesn't love beef, onions, potatoes, carrots, and celery? Stew beef is the type of meal that will stick you your stomach, allowing you to leave the table satisfied and filling full. I'm sure you know what I mean. Just put in a little prep work, add all the ingredients into a crock pot and reap the benefits of a healthy and nourishing meal. This stew beef recipe is so easy it basically cooks itself. Start the recipe of with a little prep work. Cube your potatoes and carrots, chop the onion and slice up your celery stalks. 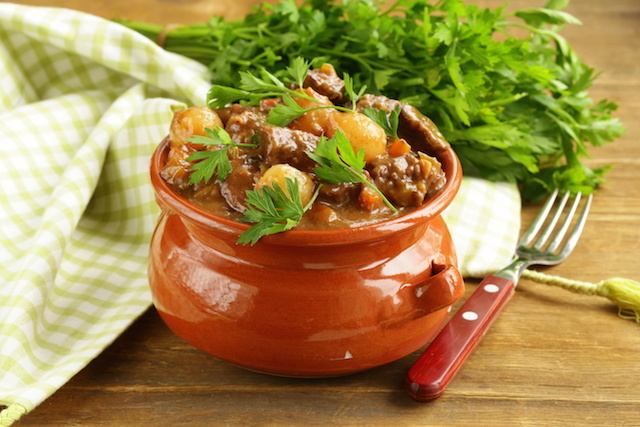 Next give your beef stew a good rinsing in cold water and pat the meat dry with paper towels and set aside. In a small bowl form your seasoning mixture by combining and mixing together seasoned salt, onion powder and black pepper. Season you meat using the mixture. Next apply a light coat of flour to the beef stew. Add vegetable oil to large frying pans and Sauté beef until all sides have browned. Transfer the beef stew to the crock pot and add whole tomatoes, potatoes, carrots and onions. Add enough water to cover ingredients. Stir to evenly distribute ingredients. Cook on low heat for 10-12 hours or high heat for 5-6 hours. The beef stew is done when the meat and potatoes are tender.